Whenever people talk about the history of the various countries in the world they tend to lay stress on the achievements of men. But we should not forget that there were lots of Women in American History figures who played a significant role in the history of various countries. Some of these women were lost in the pages of history while the others are still remembered for the contributions that they made. In the history of America, there were lots of women who came forward to change the society and make it a better place to live in. These women also enrolled their name is the war of independence that took place in America. It almost becomes impossible to ignore the achievements and contributions of women in American history. The names and achievements of the women American history makers are present in almost all the history books. All these women have biographies written on their lives. Most of the eminent historians took up the contributions of these women so that they can influence the future generations. There were lots of women among the African American slaves and some of these women tried to portray their pain through literature. Lucy Terry was one of the first woman writers who belonged to the African American slave community. The first woman in the history of America who voted was Lydia Chaplin Taft. The American women before the revolution were thought to be someone who would live inside the house and do only household work and look after the family. But after the revolution, things started changing. Women started coming out of the house and went on to take proper education. The women of that period were never allowed to join the army to fight wars but Deborah Sampson was the first woman who joined the army in the revolutionary war of America. She went forward to disguise herself as a man to join the army. Women also served on the battlefield but in some different way. They were chosen as nurses, cooks, water bearers, saboteurs as well as laundresses. Women in American history were of great significance and without them, certain things would not have been possible. 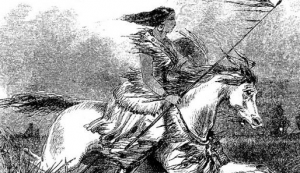 Women in American history tried to achieve something big even with so many restrictions. Later on, the lots of American women even took up writing as their profession. They came out of the household to create history in America.